The Governments of Jamaica and Russia have signed a reciprocal agreement to waive the visa requirement for travel to their respective countries. The agreement will allow Jamaicans and Russians to spend up to 90 days per year for tourism, cultural exchange or business purposes, a release from the Ministry of Foreign Affairs and Foreign Trade explained. 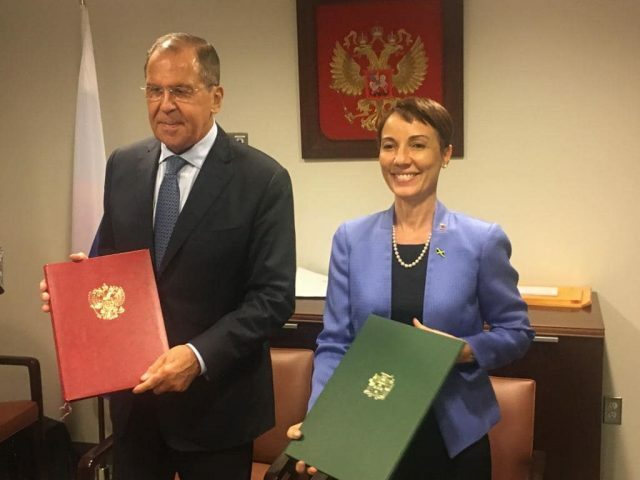 Portfolio minister, Kamina Johnson Smith signed the agreement with the Minister of Foreign Affairs of the Russian Federation, Sergei Lavrov yesterday in the margins of the 73rd session of the United Nations General Assembly in New York. “Both minister Lavrov and I agreed that the Visa Abolition Agreement will not only facilitate increased people to people exchanges, but will support the growth of tourism. We were both pleased to note in this regard, that new flights commenced this year between Moscow and Montego Bay,” Johnson Smith said. According to Johnson Smith, the signing of the reciprocal Visa Exemption Agreement brings parity in terms of ease of travel for nationals from both countries, noting that a 2014 arrangement had allowed entry into Jamaica by Russians, which arrangement had also been clarified by the new Agreement. She noted that it would undoubtedly facilitate increased trade and economic activities between the countries, and allow nationals the opportunity to travel more easily to either country for pleasure.